In the form of HeHe Er Xian immortals holding a dragon head, both with inlaid glass eyes and bone teeth.Dating early 20th Century. Each Height approx. Total weight is approx. W eight (g): 347g. We collect the folk fine art from China. Making Process: Genuine handmade. We collect the folk fine art from China. Making Process: Genuine handmade. W eight (g): 189g. Black hat is painted black and left unglazed. 2 have black CHINA stamped on bottom and 2 have impressed CHINA on bottom. Clay is made to look dark ~ majolica glaze done in beautiful colors. See pics to best appreciate excellent detail and the condition. Will lowest price for you ! Also note that monitor settings may vary from computer to computer and may distort actual colors. I Want You To Know I Will Never Allow You To Suffer Any Loss. I Am Sure We Can Work In Satisfying Co-Operation And I Wish You Happiness And That Everything Goes Well For You And Your Family. I Believe That Honesty And Credit Standing Is The Best Policy. We collect the folk fine art from China. W eight (g): 132g. Making Process: Genuine handmade. Making Process : Genuine h andmad e.
We're confident that you'll love our services. Original/ReproAntique Original. 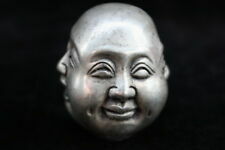 Rare Fashion fine silver personality flexible human skull statue pendant netsuke. Art is the human best interpretation of beauty. My all item are not antique ,They are all art decoration. ProductTobacco pipe. we're confident that you'll love our services. Original/ReproAntique Original. Will lowest price for you ! Also note that monitor settings may vary from computer to computer and may distort actual colors. I will do my best to make you satisfied. Region Of Origin： Original. Making Process: Genuine handmade. We're confident that you'll love our services. You may also like. Original/ReproAntique Original. We collect the folk fine art from China. Making Process: Genuine handmade. I will try my best to resolve the problem. Condition: Good condition. I will do my best to make you satisfied. will lowest price for you ! Also note that monitor settings may vary from computer to computer and may distort actual colors. You may also like. Also note that monitor settings may vary from computer to computer and may distort actual colors. We collect the folk fine art from China. Making Process: Genuine handmade. W eight (g): 235g. We collect the folk fine art from China. Region Of Origin： Original. Making Process: Genuine handmade. Making Process : Genuine h andmad e. Weight: 126g. We collect the folk fine art from China. W eight (g): 56g. Region Of Origin： Original. Making Process: Genuine handmade. W eight (g) My all item are not antique ,They are all art decoration. Art is the human best interpretation of beauty. Also note that monitor settings may vary from computer to computer and may distort actual colors. will lowest price for you ! We collect the folk fine art from China. W eight (g): 343g. Making Process: Genuine handmade. Kaleidoscope Copper. I believe honesty and credibility is the best policy. Good wishes. Making Process : Genuine h andmad e. Weight: 128g. Sub-TypeSun Goddess. Primary MaterialTibet Silver &Turquoise. we're confident that you'll love our services. We collect the folk fine art from China. W eight (g): 231g. Making Process: Genuine handmade. W eight (g) My all item are not antique ,They are all art decoration. Region Of Origin：. Art is the human best interpretation of beauty. Making Process : Genuine h andmad e. Weight: 33g.